Announcing the Winner of the Red Light/Green Light Contest! 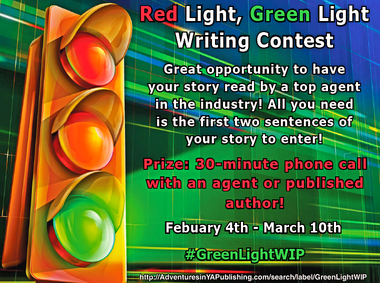 3 Announcing the Winner of the Red Light/Green Light Contest! Our Red Light/Green Light Contest has been going on for over a month now, and it’s finally time to announce the winner as chosen by our agent judge, Patricia Nelson of Marsal Lyon Literary. The winning entry will receive a 15-minute phone call with Patricia, perfect for discussing manuscript ideas or asking publishing questions! Before we announce the winner, we’d like to share the pitches of the top 5 contest finalists. Our agent judge considered these pitches of 200 words or less, along with each of the top 5 finalists’ first chapters, when choosing the winner. Twelve-year-olds Abby and Brandon couldn’t be more different. Abby’s a little rough around the edges, and lives in a cramped trailer. She doesn’t have any friends, but that’s probably because she threatens to punch anyone who gives her a sideways glance. Brandon, on the other hand, has it all—a big house, perfect hair, and a sparkling smile. He’s impressed everybody—except his successful, workaholic dad. But when a dead uncle names Abby and Brandon in his will, they discover they’re cousins—a detail their estranged fathers forgot to mention. All Abby and Brandon have to do to inherit their dead uncle’s pizza empire is compete in a series of challenges. It’s winner take all—and loser go home. As they battle to out-smart, out-create, and out-cook each other, Abby and Brandon discover things aren’t as they seem. Like, maybe neither one of them deserves the inheritance, and maybe their dead uncle isn’t all that dead, and maybe there’s something more important than money—family. SUMMER BY THE SLICE is a fast-paced 43K-word contemporary MG novel told in alternating perspectives and will appeal to boy and girl fans of humor, action, and pizza. Special water runs through Archgilly. So special, the Elders who govern the hidden town, train young men to defend it. Oliver will become a Defender if he can complete one final task – to rescue a girl in peril. Success means a drink of life-extending water. Failure means exile or possibly death. When Oliver pulls the dreaded dragon stone, he knows the girl he loves is doomed. He barely made it through training, and can’t possibly defeat a dragon. To save his damsel, Oliver must find Brig. Brig failed the final task three years ago and blames the Elders for costing him everything he loved. Determined that no future Defender will meet his fate, he fights on their behalf. Brig answers Oliver’s plea for help by using a magic pendant to alter his appearance and battle the dragon in Oliver’s place. However, even with the help of the pendant, he barely escapes the dragon’s lair, making him consider retirement. But when another desperate boy shows up, he delays it for one more rescue. Except this time the girl he must save will put both Oliver and Brig’s lives in danger when the Elder’s realize their deception. En route to Scotland to claim an inherited estate, seventeen-year-old Skye Cameron is shipwrecked on the whisky-soaked Isle of Islay, where superstitions abound. With the help of Rowan Sinclair, a young coppersmith turned reluctant whisky smuggler, she searches for her family but must first fight off a selkie’s magical allure. The island's powerful Laird harbors a longstanding grievance against her family, and Skye’s appearance on his island reignites the Laird's thirst for vengeance. He finds and kidnaps her brother, forcing Skye to choose between two halves of her heart: her family or her first love. After her traitorous uncle tries to murder her and seize the throne, eighteen-year-old Ruby Mondragon – a fiery redhead with an affinity for using her swords before her words – flees the kingdom of Furia in a desperate attempt to survive. With poison coursing through her veins, Ruby heads for the rocky foothills of Draconia, a neighboring kingdom. Seeking asylum with her estranged brother, Ruby soon meets King Emmett Dracen, who, despite his flaws, makes her feel safer than she had ever imagined possible, until disaster strikes. An army of her uncle's allies attacks Draconia, hell-bent on finishing what Ruby's evil uncle started. Leaving King Emmett behind, she retreats into the Talons, a mystical mountain range, where all of the ancient legends – magic, dragons, and their riders – truly exist. As she struggles to evade her captors, Ruby encounters a mysterious stranger in a crumbling castle who opens the door to a world of secrets buried deep in the mountains, and in the stranger's heart. With danger lurking around every corner, Ruby must summon the courage to face her enemies and fight for her throne, her people, and ultimately, herself. Seventeen-year-old Zarailla belongs to an elite group of soldiers who hunt the undead sorcerers haunting the tundra beyond the city walls. These sorcerers once ruled the land, but corrupted magic poisoned their minds and left them bloodthirsty monsters. Investigating unrest on the southern isle, Zarailla finds a group of rogue sorcerers, the few descendants of the once powerful leading families. She's sure they're trying to overthrow the current military leadership, so she lies her way into their ranks with a fake name and persona. But the more time she spends with them, the more her conviction to stop them wavers. When her closest friend embraces her sorceress heritage and joins them, Zarailla considers switching sides, too. But their plans aren't as simple as restoring the sorcerer diarchy. Their leader has also discovered a way to reverse the cursed magic and cure the undead. They need to kill those responsible for the curse in the first place: the High General and his soldiers, Zarailla's family and comrades. Facing an impending bloodbath and torn by conflicting loyalties, Zarailla must figure out what path will let her save as many of those she loves as possible, even if she can't save them all. Hopefully after reading these pitches, you can see why Ms. Nelson had such a hard time choosing just one lucky finalist! And now, announcing our winner… Dan Lollis and his book SUMMER BY THE SLICE! Congratulations, Dan!!! We'll be in touch with your prize shortly! And for those who didn’t win this time, don’t despair! We have another contest coming up soon, so check back often! Congratulations to these top five. Dan- I look forward to seeing your book in print! Wow! This is so exciting for me to be included with so many strong entries. So many great pitches and first pages. I want to read them all! Thanks for hosting the contest, AYAP!